I am fortunate to live in a lovely small town here in Northamptonshire. Within two minutes of walking out my front door I can be walking along the river or in Barnwell Park. 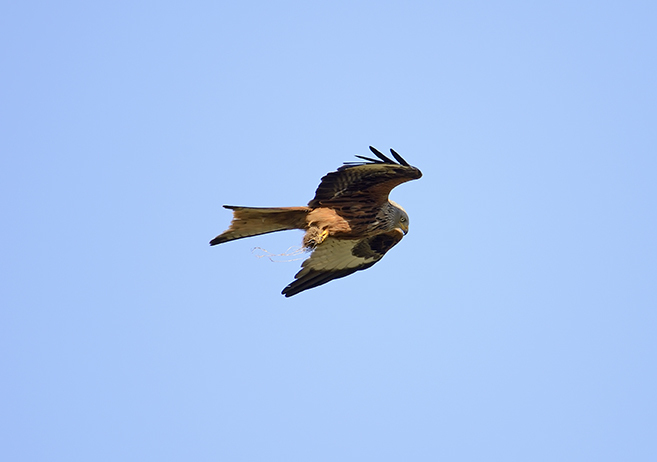 A Red Kite circles near the nest site. Oundle. 2013. 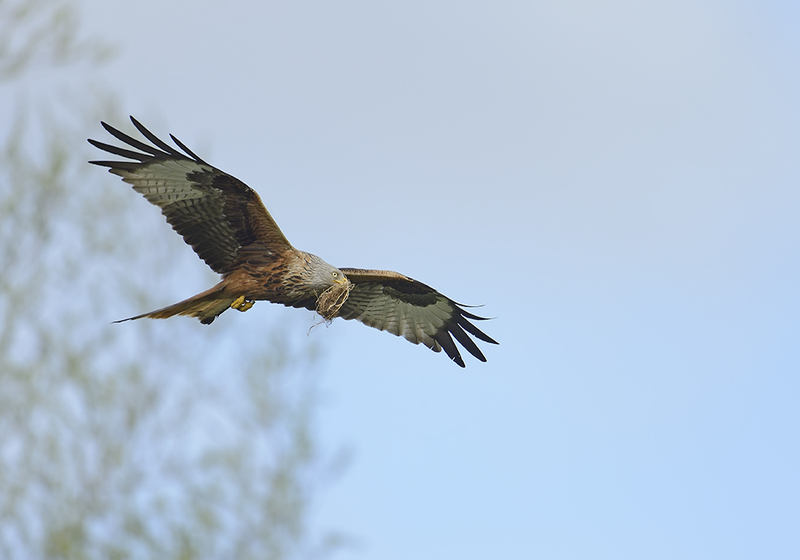 Over the last few years the red kites have become re-established in the area thanks to the conservation work at Fineshade Woods. Every day I can look out of my window and see these beautiful birds gliding over the rooftops or swooping down to pick scraps up from the football field at the bottom of the road. Sometimes some of the local youngsters can be kicking a ball at one end of the field and a pair of kites are landing at the other end, completely unfazed by the human activity. 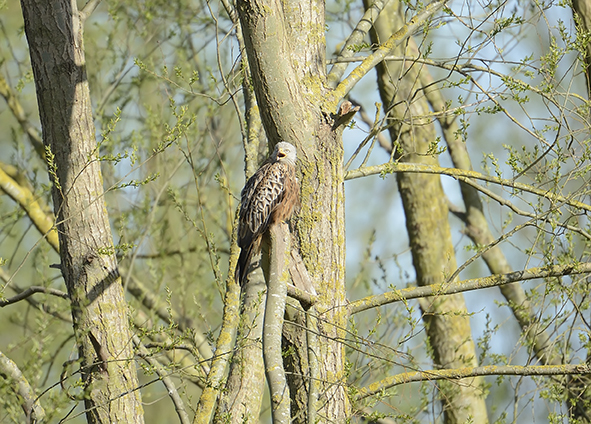 Last year a pair of red kites decided to nest in a tree a short distance from my house. I was surprised they chose this location as it is popular with families and dog walkers and can get quite busy at weekends or when the weather is good. The tree itself is on private land on the other side of the river, however still quite close to the footpath. I would have expected the kites to nest in a quieter more inaccessible location away from the possibility of human disturbance. The kites did breed successfully, as I saw two juveniles later in the year flapping around in the trees while they were learning to fly. Red Kite perched in a tree near the nest. Oundle. 2013. D4 600mm+1.4TC DX crop mode. Unfortunately last year was a total washout, the wettest I can remember since moving to Oundle. The river flooded on several occasions and has yet to return to the pre-flood level, as the ground is still completely saturated. Any rain that falls lifts the river level right back up again. Late last autumn the environment agency carried out dredging work along the river to help ease the flow, at the same time some of the trees were felled along the river bank. 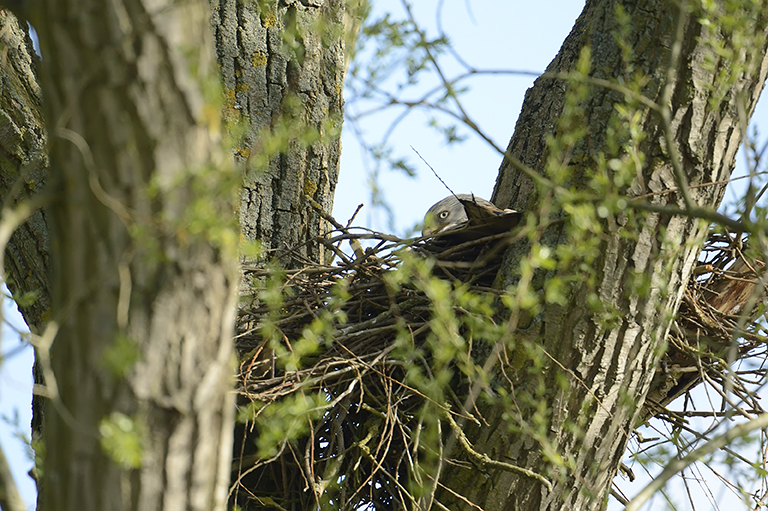 I was disappointed to discover that the tree in which the kites had built their nest was one of those trees. A Red Kite sitting on the nest. Oundle 2013. D4 600mm+1.4TC DX crop. A few weeks back while out walking, I noticed a few twigs which looked like the beginning of a nest had appeared in one of the trees. This tree stands next to the empty space where last years nest was. A few days later there were more sticks added and the nest was taking shape. 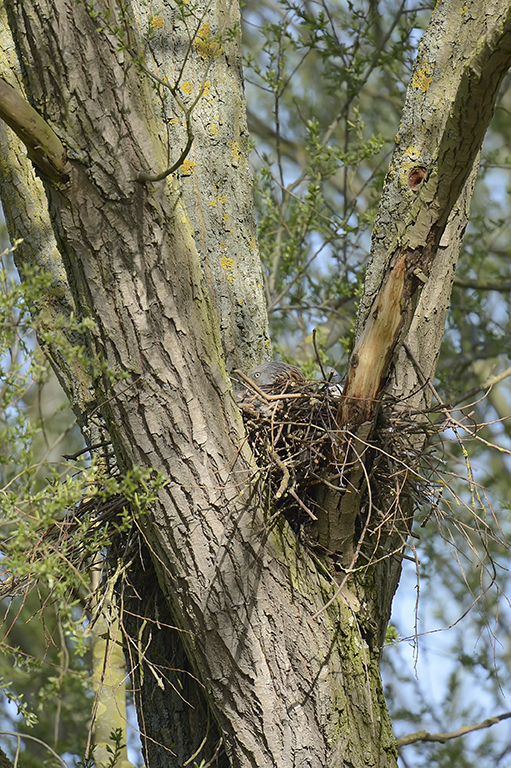 At this point I was still unsure if it was a red kite nest, however it was soon confirmed when one of the adults flew into the tree with more sticks to add to the nest. I watched as it flew down from the tree several times to collect more sticks to continue building the new nest. Last week I went along to check things out. It looked like the nest was complete and one of the birds was hunkered down in the nest. The tree was still bare with the new leaves just beginning to appear. Red Kite nest. Oundle 2013. D4 600mm. This morning was the first time I have been to look and taken my camera with me. The sun was up and shining bright and the sky was blue. I opted to leave most of my kit at home and only take my D4 with the 600mm lens. I used a monopod for support and I put my 1.4 extender in my pocket just in case I wanted more reach. Walking across the bridge at the bottom of the road I began to think I should have put my fleece on, it was colder than I had expected. Standing on the footpath out of the sunlight I really wished I had brought a pair of gloves with me and it was not long before my fingers were numb. The breeze was quite chilling, it was also quite strong against the large surface area of the 600mm lens. 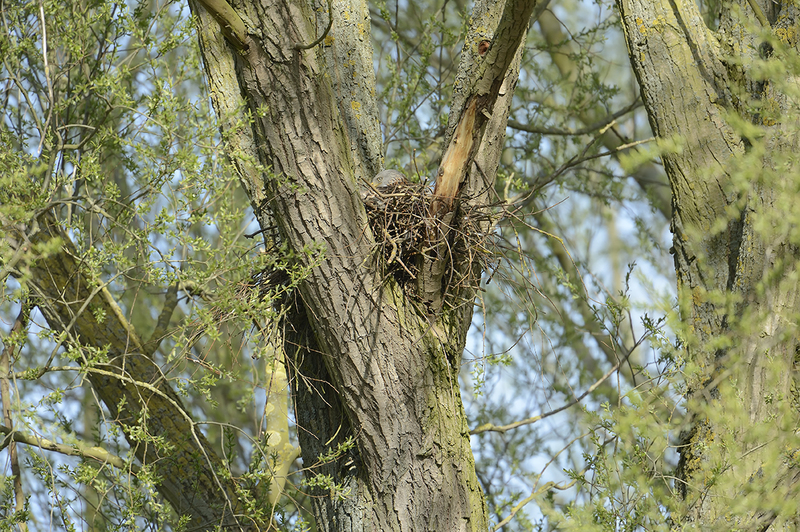 In the space of a few days of warm weather the foliage on the tree has appeared and it won’t be long before the nest is hidden from view. One of the birds was on the nest and the other bird circled low overhead a couple of times before it landed in one of the nearby trees and began preening itself. I watched them for over an hour before my cold fingers needed some warmth so I decided to head home. I’ll keep an eye on them as the year progresses and try to get some decent photos.